Os Korowai, também chamados Kolufo, são um povo do sudeste Papua (a parte sudeste da parte ocidental da Nova Guiné) . São cerca de 3.000 e  até 1970, é possível que eles não tivessem conhecimento da existência de quaisquer outras pessoas além de si mesmos . A língua korowai pertence à família das línguas Awyu–Dumut (sudoeste Papua) que é parte do filo linguístico Trans–Nova Guiné. Um missionário e linguista holandês produziu um dicionário e uma gramática da língua korowai. A maioria dos clãs Korowai vive em casas em árvores no seu território isolado. Desde o início dos anos 80 alguns vieram se mudando para vilarejos recém criados tais como Yaniruma, às marens do rio Becking (povo Kombai – área Korowai), Mu, Mbasman (Korowai-área Citak). Em 1987, outra vila foi criada, Manggél em Yafufla (1988), depois Mabül às margens do rio Eilanden (em 1989), Khaiflambolüp (em 1998). O absenteísmo é alto, pois há uma distância relativamente longa entre esses assentamentos as fontes de alimentação (sagu). ↑ Nathalia, Telly. Indonesia census turns up Papua tribe living in trees. Reuters. 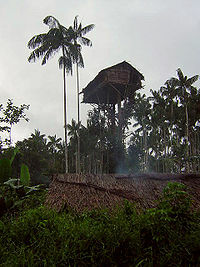 ↑ Indonesian Korowai Tribe First Officially Recognised As Tree-Dwellers The Telegraph Jul 08, 2010. Visited Jan 29, 2013. 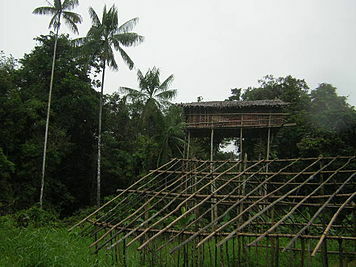 ↑ Sustainable living: Korowai tribe and tree houses. BBC. The Korowai of Irian Jaya: Their Language in Its Cultural Context (Oxford Studies in Anthropological Linguistics, 9) by Gerrit J. Van Enk & Lourens de Vries (ISBN 0-19-510551-6). Korowai: in Encyclopedia of World Cultures – Supplement (Editors: Melvin Ember, Carol R.Ember, and Ian Skoggard) pp.183–187 by Gerrit J.van Enk. Macmillan Reference USA / Gale Group (ISBN 0-02-865671-7). Society of Others: Kinship and Mourning in a West Papuan Place by Rupert Stasch (ISBN 9780520256866). University of California Press. Korowai Treehouses and the Everyday Representation of Time, Belonging, and Death. by Rupert Stasch. The Asia Pacific Journal of Anthropology. 12(3): 327-347. Textual Iconicity and the Primitivist Cosmos: Chronotopes of Desire in Travel Writing about Korowai of West Papua. by Rupert Stasch. Journal of Linguistic Anthropology 21(1):1-21. Word Avoidance as a Relation-Making Act: A Paradigm for Analysis of Name Utterance Taboos. by Rupert Stasch. Anthropological Quarterly 84(1):101-120. The Camera and the House: The Semiotics of New Guinea “Treehouses” in Global Visual Culture. by Rupert Stasch. Comparative Studies in Society and History 53(1):75-112. Knowing Minds is a Matter of Authority: Political Dimensions of Opacity Statements in Korowai Moral Psychology. by Rupert Stasch. Anthropological Quarterly 81(2): 443-453. Referent-Wrecking in Korowai: A New Guinea Abuse Register as Ethnosemiotic Protest. by Rupert Stasch. Language in Society 37(1):1-25. Demon Language: The Otherness of Indonesian in a Papuan Community. by Rupert Stasch. In Bambi Schieffelin and Miki Makihara, eds., Consequences of Contact: Language Ideologies and Sociocultural Transformations in Pacific Societies, pp. 96–124. Oxford University Press. The Semiotics of World-Making in Korowai Feast Longhouses. by Rupert Stasch. Language & Communication 23(3/4):359-383. Separateness as a Relation: The Iconicity, Univocality, and Creativity of Korowai Mother-in-law Avoidance. by Rupert Stasch. Journal of the Royal Anthropological Institute (n.s.) 9(2):311-329. Joking Avoidance: A Korowai Pragmatics of Being Two. by Rupert Stasch. American Ethnologist 29(2):335-365. Esta página foi editada pela última vez às 20h36min de 20 de junho de 2018.